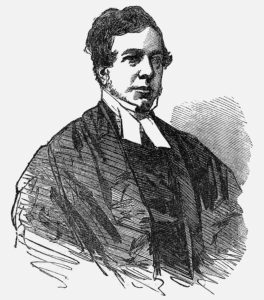 There is a connection between the origins of rugby and the Army by virtue of the fact that William Webb Ellis (1806-1872), who is credited with inventing the game at Rugby School in 1823 when he showed a “fine disregard for the rules of football [soccer] … took the ball in his arms and ran with it, thus originating the distinctive feature of the Rugby game”, was the son of an Army officer, James Ellis. James Ellis began his military career as an ensign in the 1st dragoon guards and served in Ireland in 1807. A year later he was posted to the regimental depot in Manchester, before proceeding to the Peninsular War in 1809. On 14 September 1809 he bought a commission in the 3rd dragoon guards for £735. He died in Albuera on 1 July 1812. His death left his family penniless, so William’s mother, Ann Webb, applied for a pension and was granted £10 for each child. William received free education at Rugby School and went on to win a place at Brasenose College, Oxford. After leaving Oxford, he entered the church. Between 1836-55 he was rector of St Clement Danes Church in the Strand, London (now the Central Church of the RAF), where the Royal Air Force Rugby Union (RAFRU) later erected a tablet to his memory. He never married and died at Menton, Alpes Maritimes, France, on 24 January 1872, unaware of his legacy to the game. The game was gradually institutionalised through it being played at other British Public schools and universities. it was during the second quarter of the nineteenth century that rugby acquired its distinctive features such as an oval ball, H-shaped goals, scoring above the cross bar, and points for ‘tries’ as well as ‘goals’. Initially, like other sports within the Army, rugby was as officers’ game, because until the Second World War (1939-45) the Army generally recruited its officer corps from public schools and those recruits brought the game with them. It was only after they had taught their soldiers how to play that the game became truly inclusive. The earliest recorded game of rugby played in the Army was between a Cavalry XI and an Infantry XI at Balaclava, Crimea on 27 March 1855. The game was conducted under the Eton rules with each team fielding eleven players. Unfortunately there is no record of the final score or who won the match. Our school history lessons covering the duration of the Crimean War (1854-56) generally focused on the political background, the death or glory, the suffering of the diseased and wounded, the early beginnings of professional nursing, but they certainly didn’t mention that the conflict saw the birth of rugby within the British Army. 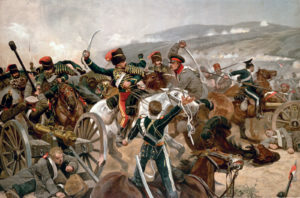 It is hard to imagine that the match was played exactly one year after Great Britain and France went to war with Russia and less than six months after the Charge of the Light Brigade. In March 1859 the 2nd and 3rd Battalions of the Grenadier Regiment of Foot Guards played twenty-five-a-side game at Lords Cricket Ground, London; the game ended in a draw. The matches were played with various team sizes under a variety of different game rules. In 1862, at Aldershot, the 53rd (Shropshire) Regiment beat the 8th (Kings) Regiment in a match at which each team fielded twenty men. The following year the School of Musketry, Fleetwood, Lancashire played a thirteen a-side rugby team against Rossall School (a local public school founded in 1844) in a match that was played under the Harrow rules. During the 1866/7 season the 8th Depot Battalion at Colchester, Essex was said to have a good side which played under a combination of Eton and Rugby school rules. During the 1860s and 70s Army establishment and regimental teams began to organise matches against local civilian teams. The Royal Military Academy, Woolwich team, consisting of Gentlemen Cadets training for a commission in either the Royal Artillery or Royal Engineers, played against Richmond RFC in the 1864/5 season and went on to secure a first-rate fixture list with many of the best clubs in London and the suburbs. Likewise the 94th Regiment and 93rd (Sutherland Highlanders) Regiment, stationed in Ireland, arranged matches against such clubs as Landsdowne, Dublin Wanderers and Dublin University. The 21st Lancaster Rifle Volunteers played a match against Oldham Club during the 1878/79 season. Within the Army matches between Royal Military Academy, Woolwich and the Royal Military College, Sandhurst began in 1876 and continued until the Royal Military Academy, Woolwich was closed in 1939. Standard codes of playing were developed in the 1870’s during which time governing unions were formed: The English Rugby Football Union (RFU) in 1871, the Scotland Rugby Union in 1873, Irish Rugby Football Union in 1874 (the two Irish Unions were merged in 1879) and the Welsh Rugby Union in 1880. These unions organised the game and arranged international matches in which many officers, and later soldiers, who played for first-class local teams, were selected to represent their respective nations. England – Two Royal Engineers (Sappers); Lieutenant CW Sherrard RE (2 England caps) and Lieutenant CA Crompton RE (1 England cap), both members of Blackheath RFC, became the first soldiers to gain the distinction of playing for their country (England) in the first ever international game. The Scotland v England match played at Raeburn Place in Edinburgh, 27 March 1871, in front of a crowd of 4,000 (Scotland won by one goal and one try to one goal, the teams were 20-a-side and Halves were 50 minutes each). Scotland – The following year (1872) they were followed by Lieutenant FT Maxwell RE and Lieutenant HW Renny Tailyour RE, also Sappers, who were capped for Scotland. (Renny Tailyour also played cricket and soccer and was a member of the Sapper Football team that won the FA Cup in 1875. Wales – In 1881 Lieutenant RD Garnons-Williams, Royal Fusiliers gained a cap for Wales. Sadly at the age of fifty-nine Garnon-Williams was killed in action, whilst commanding his battalion, at Loos on 27 September 1915. In 1947 Captain J Matthews, Royal Army Medical Corps was chosen to captain the Wales team. He was awarded 17 Welsh caps. Ireland – Lieutenant AP Cronyn, Royal West Kent Regiment was the first Army officer to be selected to play for Ireland in 1875 and was awarded 3 Irish caps. He was followed in 1877 by HW Murray, Indian Medical services. 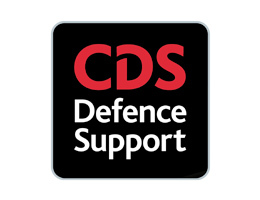 Full details of Army personnel who have been awarded caps can be seen on International Caps page. On 13th February 1878 the Officers of the Army played, for the first time, the Officers of the Royal Navy at Kennington Oval. The Royal Navy won the match by a goal and a try to a goal. 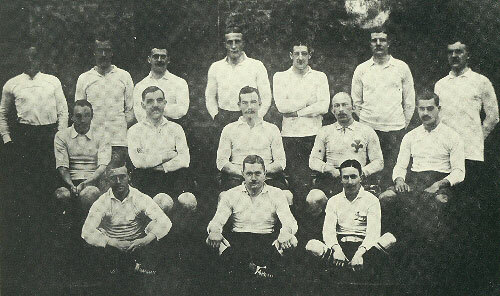 Although the popularity of rugby increased in the Services, no further recorded matches took place between the Army and Royal Navy until 1907, after which an annual Inter-Service Championship was inaugurated. The Championship was suspended during the First (1914-1918) and Second World War (1939-45) but resumed in 1920 and 1946 respectively. An account of the match can be found on the Army Navy Match (1878-1914) page. The Royal Air Force (RAF), formed in 1918, became competition participants in 1920. In the early years of the Championship the Royal Navy dominated the game, but since the Second World Wars the fortunes of Army has been in the ascendancy (see the Inter-Services Championship statistics). Separate Inter-Service competitions were created for women and veteran (over 35 years) service teams in 2003. Since the inauguration of the women’s competition the Army Women have dominated the championship. The Army did much to spread an enthusiasm for rugby worldwide as indeed it did for our other great national games; cricket and football. Interest in the game was generated by the regiments stationed throughout the British Empire who had regimental rugby teams that played locally. Australia – The Australia RU claim that there “are reports of early games of rugby between the army and the crews of visiting ships being played at Barrack Square in the city [Sydney] in the 1820s” – but given the early date it is unlikely that they were playing rugby as we understand it. Canada – The first game of rugby recorded in Canada took place in Montreal among artillery men in 1864. On the West coast the first game in British Columbia was played on Vancouver Island in 1876, between members of the Royal Navy and the Army. In 1919, a Canadian Services Team played overseas against representatives from England, New Zealand, South Africa and Australia. India – The game was played by British Army regiments stationed throughout India from 1870’s onwards and there is even a report that a game was played in the Bhulan Pass, Afghanistan by regiments of Major General Biddulph’s Thul Chotiali Force in 1878. The 29th Bombay Native Infantry (Duke of Connaught’s Own Belooch Regt) Field Firing (Marching Order) by Richard Simkin – Part of Major General Biddulph’s Thul Chotiali Force in 1878. 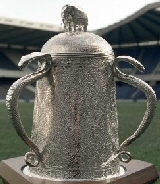 The Army had a hand in the conception of the Calcutta Cup, the oldest trophy in the history of international rugby. It began with the 3rd (East Kent) Regiment (The Buffs) and the 62nd (Wiltshire) Regiment (Duke of Edinburgh’s) who were both great supporters of the Calcutta Club,(in Calcutta India) and were very active in establishing rugby in India. However, the posting the The Buffs out of India in 1876 occasioned a wane in the enthusiasm for rugby and two years later reductions in membership forced the Calcutta Club to reluctantly disband. But after finding 270 silver Indian rupees in the kitty its committee decided that they would make a cup with them – thus the Calcutta cup was born with its distinctive Indian favour that consisted of patterned bowl, three sculptured cobras as handles and an elephant adoring the lid. The committee was keen to perpetuated the name of the club and decided in 1879 to present their Calcutta cup, to the English Rugby Football Union on the proviso that it should be competed for annually by representative rugby teams from England and Scotland. The Cup was first competed for on 10th March 1879 – the match, at Raeburn Place, Edinburgh ended in a 3 all draw. The following year on 28 February 1880 England become the first winners of the Calcutta Cup when they beat Scotland at Manchester by 2 goals & 3 tries to 1 goal. The evolution of the administration of the game in the Army was ‘slow and steady’. The idea for an administrative body to govern the Army game came to three young officers: Lieutenant JEC ‘Birdie’ Partridge, Welch Regiment, Lieutenant WSD Craven, Royal Field Artillery, Lieutenant (later General Sir Clive) CG Liddell (1883-1956), Leicestershire Regiment while on tour as part of a Blackheath RFC team in Scotland during the 1905/06 season. But it wasn’t until 31 December 1906 that the Army Council approved the formation of the Army Rugby Union (ARU). Almost eight months later, on 10 August 1907, Field Marshal the Duke of Connaught consented to be the Union’s first President. 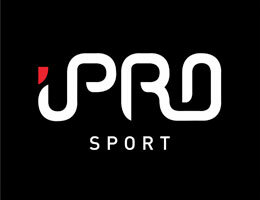 Red jersey with a white collar and white badge formed of the letters ARU with ‘Royal Cypher’ above, also in white. Stockings – red with white tops (5 inches). 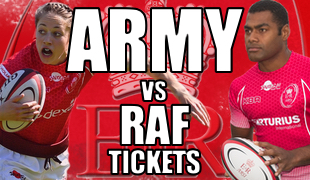 Fixtures against Oxford and Cambridge Universities should be a high priority; these fixtures remain a highlight of the Army Senior XV’s season each year. An executive committee should be elected; those elected in 1908 included representatives from the Army Ordnance Corps, the Royal Army Medical Corps and the Leicestershire Regiment. In 1907 the English Rugby Union donated a cup to the Army for inter-unit competition. The cup was to become known as the ‘Army Cup’ (now the Premiership Cup). It was first competed for in the same year of its donation and was won by 2nd Battalion the West Riding Regiment (later the Duke of Wellington’s Regiment) who beat the Training Battalion, Royal Engineers 5-0 in the final. The trophy was presented by General Sir John French. The 1908 Army Cup final, played at Aldershot, between 1st Leicestershire Regiment and 1st Welch Regiment was initially postponed due to snow. When it was eventually played the game was won by the Leicestershire Regiment 5 points to 4 – a goal to a drop goal. It was a very hard game in which the Leicestershire Regiment managed to maintain their record of never having their opponents cross their line in an Army match that year. See Army Cup (now the Premiership Cup) statistics. During the sixty-year period leading up to the First World War sport became one of the pillars of military training under a philosophy of “training for sport was training for war” . The playing of sport, which included rugby, coupled with ‘physical PT’ helped to prepare the British Army for the rigours of war and was a guiding principle in the physical training of the civilian volunteers who made up Kitchener’s Army that was to replace the ‘Old Contemptible’s’ of the original British Expeditionary Force (BEF). In May 1914, on the conclusion of the 1913-14 season, the ARU decided that there would be no Army v Navy matches and that the Army Cup competition would be suspended for the duration, both competitions resumed in 1920. On the outbreak of war the Royal Military Academy, Woolwich and Royal Military College, Sandhurst also suspended their matches but resumed them in 1916. In 1915 a newly formed battalion of Northumberland Fusiliers recorded in their journal that: “The rugger and soccer teams are now quite an institution and every Saturday afternoon sees an inter-Company match or a match with a local battalion.” (quote from St Georges’s Gazette Vol 33, the journal of the Northumberland Fusiliers). The men took this sporting spirit with them into battle. 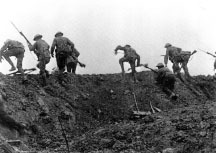 Battle of the Somme (1916) – Two companies of the 16th Battalion, Northumberland Fusiliers set off from their trenches behind a high drop-kicked rugby ball. Tragically all but 11 men of eight platoons (approx 240 men) who followed it were cut down by machine gun fire. Mobbs’ Own – A sporting battalion – An enthusiasm for rugby was also the inspiration for rising one of the most notable of all the sporting battalions, ‘Mobbs’ Own’, comprising solely of rugby enthusiasts from Northamptonshire and Bedford. The man responsible was England back Edgar Roberts “Mobbsy” Mobbs (1882-1917), who raised and commanded the battalion. Sadly, during the battle of Passchendaele (3rd battle of Ypres), Edgar was killed in July 1917 whilst attacking a German machine gun post at Zillebeke. His body has never been found, but his name is on the Menin Gate memorial and for his bravery he was awarded the Distinguished Service Order (DSO). After the war a memorial match to commemorate the life and achievements of “Mobbsy” was instigated in 1921 and is now the longest standing fixture of the Barbarians RFC. On 17 March 1918, just a few days before the German Spring Offensive (Operation Michael, which began on 21 March), the 20th (Light) Division, located in the St Quentin area as part of the Fifth Army, organised a knock-out contest featuring rugby and other sports. Similar contests were frequently held throughout the war at the training camps in Britain, France, and other theatres of operations. In some cases where the games were played under Northern Union rules there was some question over the playing status of ARU members. In the aftermath of the war Maj Gen CE Heath CVO CB was elected President and Major JR Rainsford-Hannay DSO, Secretary and under their leadership the ARU slowly began to pick up the pieces. On 28 February 1920 the first post-war Army v Navy match was played at Twickenham. It was attended by King George V and Edward, Prince of Wales. The match reflected the changes in social conventions brought about by the war because, for the first time, the team included the Welsh International CSM, CW Jones (Welch Regiment). He was the first non-officer to be selected for a representative Army side. The Army lost (11-23) and were to continue loss for the next four years. In 1920 the newly formed Royal Air Force (RAF) began to enter a team into the Inter Services competition and were beaten by the Army (21-9) in their first match against “the Reds”. The era was seen as ‘golden’ with the Army side dominating the Inter Services competition frequently beating both the Navy and RAF sides to win the overall competition. In the same year a match between the two allies’ armies British and French was organised and repeated until 1931. For more see Army Cup (now the Premiership Cup) Statistics. In 1929 AL Novis, Leicestershire Regiment captained the England XV as did DA Kendrew, Leicestershire Regiment the following year. During the 1930s Army players were selected to play for their national teams as well as the British Lions. The question of refereeing both representative and unit matches was raised at an ARU meeting in 1921, but it was not until 1931 that the first list of Army referees was published. 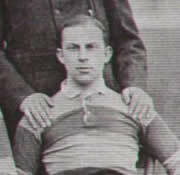 Top of that list was Lieutenant Colonel HC (Tiny) Harrison, who took up refereeing after playing for England (1909-14). He refereed the 1922 France v Scotland match. Captain WDC Greenacre was the first Army referee to represent the ARU in the London Society of Referees. He was later selected as the first Chairman of the Army Rugby Union Referees Society (ARURS) in 1939. The success of rugby between the wars matured both the ARU as an organisation and rugby as an Army game, which put them on a much stronger footing when the Second World War began than it had been at the beginning of the First World War. As a result rugby did not suffer the same way it had done twenty years previously. During the ‘Phoney War’ period (Sep 1939 – May 1940) a British Army team played a French Army team in Paris on 24 February 1940, the match was won by the British (36-3). Just fourteen weeks later the Germany Army had over run Northern France and the remains of the British and French Armies were being evacuated off the beaches of Dunkirk. Paris fell to the Germans on 14 June 1940. Games were played at home and overseas throughout the war and were enjoyed by both Union and League players from all three Services. Matches took place as far a field as Singapore, Kuala Lumpar, Cario, India and Burma. There is also a record of rugby being played in prisoner-of-war camps in Europe. At home rugby played its part in maintaining national morale for in 1942 a number of Service International matches, with teams drawn from Servicemen, were played at a variety of venues across the British Isles. The matches were played between teams representing England, Scotland and Wales and aroused immense interest among the general public so were continued until the end of the war. A unique match took place in 1943 between a Northern Command Rugby League XV and a Northern Command Rugby Union XV. It was played at Headingly, Leeds under RU rules and was won by the League XV (18-11). Just after the end of the war in the Far East two units of the Parachute Regiment of the 6th Parachute Brigade played each other in Java, the game was watched by a large number of Japanese prisoners-of-war. The first matches to be played after the Second World War in 1945 were between the Army team and a team fielded by the newly formed British Army of the Rhine (BAOR), the Army XV won both games. The 2nd New Zealand Expeditionary Force (The Kiwis) played a total of 33 games including matches against the British Army, France and Scotland. The British Army lost the match (25-5). (Postnote – the Kiwis reprised their historic tour in 2005: on that occasion they lost to the British Army 25-15, but their Women’s team beat the British Army women’s team 24-8). The decade of the 1960’s was very much the Duke of Wellington’s Regiment. They were finalists in the Army Cup for seven years (1960, 1961, 1962, 1965, 1966, 1967, 1968) winning the Cup on four consecutive occasions between 1965-68. Their dominance was only seriously challenged by the 1st Bn Welsh Guards who were finalists on six occasions, but only succeeded in winning the cup on three (1962, 1963, 1964). They lost out to the Duke of Wellington’s Regiment in 1965 and 1968. In the 1970s the Army Cup was dominated by the Welsh regiments. The 1st Bn Welsh Guards won the competition in 1970, 1971 and 1973. The first two matches were all Welsh finals with the 1st Bn Royal Regt Wales the losers. However, they did win the Army Cup in 1974, 1976 and 1977. The other winners in the decade were the Yorkshiremen of the 1st Bn Duke of Wellington’s Regt in 1972, 1975, 1978 and 1979. The 1980s opened with a win for 3rd BAPD, Royal Army Ordnance Corps against 1st Bn Royal Regt Wales. This break for the tradition winners led to wins by 21 Engineer Regt, Royal Engineers (1983) and 7 Signal Regt, Royal Signals (1984, 1989) but there also emerged from the decade a team which would dominate the competition in the coming decade, the team was 7th Regt Royal Horse Artillery who showed early promise when they won the Army cup in 1985, 1987 and 1988. The 1960s also saw a resurgence of Army dominance in the Inter-Service Competition. They won it outright on eight occasions in 1960, 1963, 1964, 1965, 1967, 1968, and 1969. That dominance was lost in 1970’s when the Army only won the competition twice firstly in 1972 and secondly in 1976. It was really the Royal Navy’s decade who won the championship four times. 1975 and 1978 saw triple ties. The Army did better in the 1980’s winning in 1980, 1983, 1988 and 1989. There was a triple-tie in 1984. The fall of the Iron Curtain in 1989 heralded the end of the Cold War and the start of a new era, which triggered a review of the armed services under the title of Options for Change. The review brought about changes in the size and deployment commitments of the Army, which had an impact on the Army Rugby Union. During the 1990’s the Army’s performance in the Inter-Service Competition was varied, they won the competition in 1990, 1997, 1998 and 1999. There was a triple-tie in 1992 and 1996. The Army XV’s performance was greatly enhance by the inclusion of Fijian soldiers serving with the British Army. Under the coach, Lt Col A Hickling, Royal Signals the Army dominated the Inter-Service Competition through the first half of the 2000’s wining the competition for a record fifth successive time in 2005. By the mid 1990’s servicewomen were regularly playing rugby and in 1996 their efforts were officially recognised by the ARU. Women’s rugby grew under the guidance of one of its founders Lt Col EE Cunningham, Adjutants General’s Corps (AGC). Success was soon in coming; during their tour of Cyprus the Women’s Tens Team lifted the Akrotiri Tens Cup in 2001. A Women’s Inter-Service Competition was introduced In 2003. The inaugural competition was won by the Army who, under the captaincy of Major S Butler, beat both the Royal Navy (35-5) and the RAF. Since its inception the Army has dominated the competition. 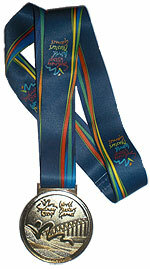 In 2005 the women made their first international tour to Canada it was followed with a tour to New Zealand in 2008. The Army Cup was dominated by 7 Regt Royal Horse Artillery during the 1990’s. In ten years they won the Cup on 8 occasions (1990, 1991, 1992, 1993, 1995, 1996, 1998 and 1999). Their only serious rivals were 7 Signals Regiment who beat them in the final of 1994. They did not manage to get into the finals in 1997, when the final match was between 2 Signals Regiment and 1 Royal Welch Fusiliers. The 2 Signals Regiment won. A major reorganisation of the community rugby competitions took place during the season of 2006-07. Inter Corps Championship (formerly Corps Merit Table). Premiership Cup Competition (formerly the Army Cup). Community Cup and Shield Competition. The Army has a long history of playing Sevens at club level and annually holds a major tournament culminating in a finals day at Aldershot. But it was not until 2000 that the army formed a representative team, which become the Army Sevens. Since its formation it has developed into a formidable team and has become a significant force in the game. They have won some of the games’s major competitions: Middlesex Sevens, Dubai and Singapore. The beginning of Centenary Season was marked with a dinner at the Tower of London, the guest list included: President of the Irish Rugby Union, Mr Peter Boyle, President of the RAFRU, Air Marshall David Pocock CVO BA RAF, President RFUW, Ms Gill Burns MBE, President of the RFU, Mr Bob Rogers and President of the Welsh Rugby Union, Mr Keith Rowlands. Part of the Centenary celebrations included a Centenary Dinner in London and a ‘Festival of Rugby’ held at Aldershot. The Senior XV won the Inter-Services Championship for a record sixth successive time beating both the RAF (54-10) and Royal Navy (39-25). 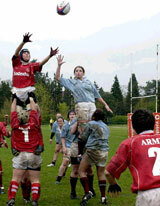 Similar Inter-Service success was achieved by the Women’s XV and Veterans’ XV. The Women’s XV celebrated its tenth season. In June 2007 the Senior XV Squad embarked on its Centenary Tour of Australia and New Zealand, where they defeated teams fielded by the Australian Army (36-0) and the New Zealand Army (11-6). At Twickenham the Senior XV won the Inter-Services Championship for a record seventh successive time. The Women’s XV had similar success in their Inter-Services Championship remaining the un beaten champions. In the summer the women’s team toured New Zealand. The Veterans beat the Navy, but lost to the RAF. On 10 May 08 a British Army (Germany) XV stunned a touring Australian Army XV by beating them 15 points to 13 at Sennelager. The 2nd Royal Welsh beat 23 Pioneer Regiment RLC to win the Premiership Cup (ex-Army Cup). The Community Cup was won by 17 Port & Maritime Regiment RLC and the Shield by 3 Scots. The men of Royal Engineers won the Corps competition. The Corps competition was extended to include the women and was won by the REME, who beat the women of the Army Medical Services. The 2008-09 season was another very successful season for the ARU. The Army representative teams secured a clean sweep in the Inter-Services Championships. The Senior XV achieved a record breaking 8th successive win by beating the Navy (50-7) and RAF (67-11). The Women’s XV continued their unbroken dominance by beating the Navy (60-0)and RAF (71-0). The Veterans regained the title by beating the Navy (36-16) and RAF (38-3). There were also signs of future promise as the U23s beat both the U23’s Royal Navy (34-9) and U23’s RAF (19-3). In the Corps Competition the Sappers secured a ‘triple crown’ by beating the REME (28-8). The Community Cup competition was won by SEME, who beat BA (G) based ARRC SP (18-6). The 1 Scots won a ‘double’ by beating Welsh Guards (29-20) to win the Premiership Cup in March 09 and followed that success by beating 17 P&M Regt RLC (42-12) to win the Army Sevens Tournament on 20 May 09. The BA (G) Sevens Tournament was won by the Scots DG (B Team), who beat the Scots DG (A Team) (64-10) and the Women’s Sevens Tournament was won by the REME (W), who beat the RLC (W) (39-12). Through the Summer 2009 the Army Sevens, in their tenth season, was skippered to success by Scottish International, Capt Mark Lee at the Roma Sevens (Plate winners), Newquay Surf Sevens (winners) and Worthing Sevens (winners). The season opened with a BA (G) rugby tour to Italy (27 Aug – 4 Sep 09), which sadly ended in defeats to Venice RFC (an Italian super 10’s side) and Roma Rugby (33-17). The Army Veterans entered the Sydney World Masters Tournament (10-18 Oct 2009) to emerge as the rugby Gold Medallists after beating the hot favourites, the White Hart Marauders 7-5 in the final. 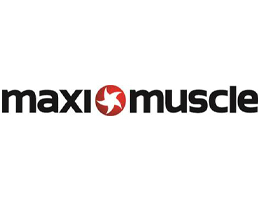 In honour of their success the team was re designated the ‘Army Masters XV’. The Senior Squad held its usual pre-Inter Services training in South Africa, but due to volcanic ash from eruptions in Iceland that grounded aircraft in Europe, were unable to return in time play their fixture against the RAF. The match was subsequently cancelled. Their performance in the Army Navy Match at Twickenham was disappointing resulting in a 22-24 defeat leaving the Navy as Champions for the first time since 2001. The Women’s XV maintained their undefeated record in the Inter-Services by beating the RAF (35-12) and Navy (25-11). Their founder and chairwoman, Lt Col EE Cunningham stepped down from the chair at the beginning of the season. The Army Master’s XV unfortunately lost their RAF Inter Services match 10-6, but defeated the Navy 28-19. The RAF, who beat the Navy, were declared the Champions. The Army U23’s repeated their previous season’s performance beat both the RAF (22-3) and Navy (30-5). Pte Apo Satala (1 SCOTS) was capped for Fiji and represented his country in matches against Scotland and Ireland. LCpl J Leonard (RE) was selected to play for England and was awarded ‘Combined Services Female Sports Personality of the Year’. In the Corps Competition held at the beginning of the season the Sappers won the 15’s beating the RLC, the RAC won the 10’s beating Int Corps and the RLC overcame the REME in the Women’s competition. The Sappers continued their success when they were crowned the Corps (Merit Table) Champions for a fourth time. They beat the RLC 35-25. In the Women’s Corps Championship the RLC v REME final was reprised with the RLC being victorious again. 25 Engr Regt beat 29 Cdo Regt RA to win the Community Cup whilst the Community Shield went to 5 SCOTS who beat 16 Regt RA. A cracking ‘all Welsh’ Premiership Cup final between 2 Royal Welsh and 1 Welsh Guards was played at Aldershot. The Guards who had lost the final to the 1 SCOTS the previous season were again to be the cup runners up losing to the 2 Royal Welsh 31-26. The final competition of the season, the Army Sevens Tournament, ended in controversy when the winners of the Men’s Cup, 17 P&M Regt RLC, withdrew from the Tournament leaving the vanquished 1 SCOTS the winners. The Men’s Plate was won by 23 Pnr Regt RLC who beat 3 SCOTS (22-10) and the Ladies was won by the RLC Women who beat AMS (22-10).